Whether your political leanings make you for or against the Affordable Care Act (A.K.A. Obamacare), the new laws surrounding health insurance are leaving opportunities for improved health benefits in their wake. The two biggest catalysts for these opportunities are tied to the individual mandate (requiring all U.S. citizens to have health insurance) and Guaranteed Issue (requiring insurance carriers to issue coverage to applicants despite health history and pre-existing conditions). The key result of these two components of Obamacare is a massive improvement in the individual insurance product. Add government subsidies to this formula and you get better benefits at a lower cost to the majority of consumers and their employers. This dynamic is driving important opportunities for large businesses. According to a 2015 study by Accenture, an estimated 6 million members enrolled in individual health insurance policies using a defined-contribution from their employer, and an employer-sponsored private health exchange for 2015 benefits—that’s 600% of the number of active employees that were insured this way just two years ago. The study projects that this number will rise to 40 million by 2018. So, if large businesses are recognizing the value of controlling their benefits costs while providing employees access to the perks and value of the individual market, what about small businesses? 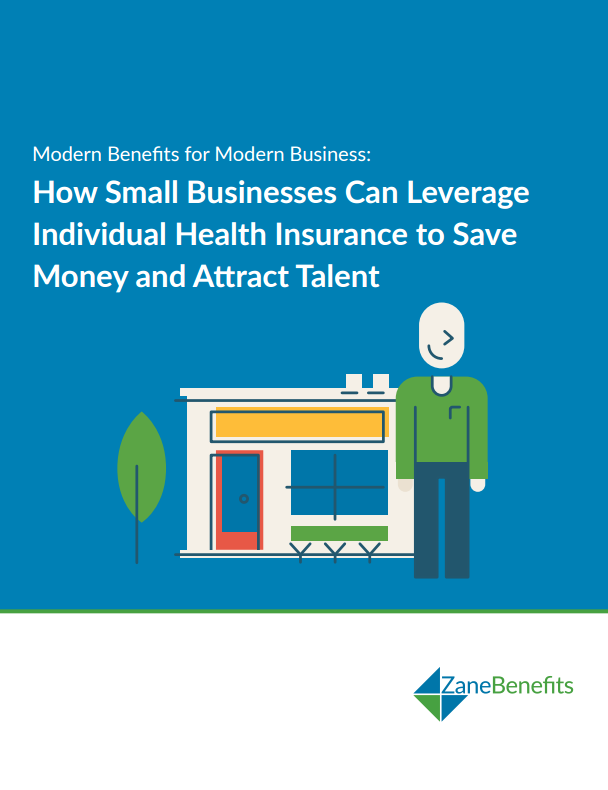 Zane Benefits has been leading the effort to improve health insurance for small businesses since 2006, and recently published an eBook titled Modern Benefits for Modern Business. This solution-focused guide helps small business owners explore the option of using a health reimbursement plan (HRP) to supplement individual health insurance for their employees—as an alternative to traditional group insurance. In addition to providing an arguably better alternative for small businesses already offering health benefits to their employees, this eBook provides a valuable resource to the millions of small businesses who do not currently provide health benefits of any kind.